Rancho Cañada del Oro Open Space Preserve is a relatively small county preserve near Morgan Hill. If you add up all the trail segment lengths shown on its official trail map, you get only about nine miles of total trail length (not counting a tiny paved loop). This ride covers all of those trails. While the trails here are also connected at multiple points to the trail network of the adjoining Calero County Park, the trails in that neighboring park are unfortunately not legal for mountain bikes at the moment. This park is one of the lesser-known options for mountain bikers in this area, especially compared to nearby destinations such as Almaden Quicksilver, Santa Teresa, and Henry Coe. The park's website explains that the trails here were opened to mountain biking only in 2007. While it's not a ride location that presents a lot of room for variation, it's still a bit of a hidden treasure as well as containing some passable singletrack. While no one could make a believable claim that the park should be a draw for bikers from distant parts of the Bay Area, it's still a shoo in for inclusion on the "usual list" of ride locations for local riders, in my opinion. The ride takes place around the cute small valley of Baldy Ryan Creek nestled in the foothills of the coastal range, and atop the ridges on either side of it. The setting ranges from bare hilltops that afford panoramic views of the southern reaches of the South Bay, to beautiful oak-sprinkled hillsides that will be doubly pretty during the green-grass months of the year, to the dense cover of bay trees near the creek bed. The trails are a mix of typical, smooth fire roads and some multi-use trails that I don't mind classifying as "singletrack" though that's mainly thanks to some narrowing down by vegetation over several seasons. This ride begins by following Mayfair Ranch Trail as it climbs up a ridge, follows along its spine for a while, and then descends by some switchbacks toward the creek on the other side. This is one of those multi-use trails I've mentioned above, and the park's website states that it was built in 2007. The initial climb on Mayfair Ranch Trail is a significant climb, though (never exceeding an average of 10% grade) it's not one about which you'd be composing stories of bravery. 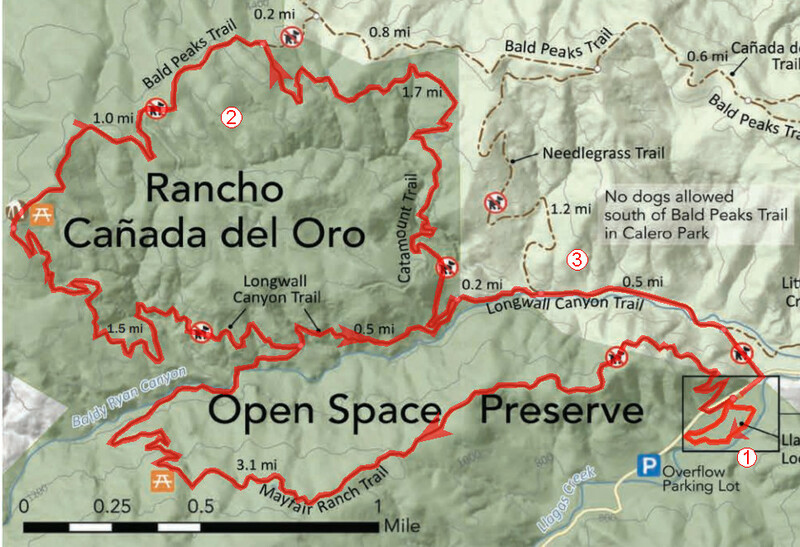 You can actually avoid Mayfair Ranch Trail altogether, if all that you're interested in is a really short loop to Bald Peaks to take in some views. I would recommend trying it in at least one direction, though, because it's one of only two trails on this ride that would qualify as singletrack, and it's easily the sweeter and more scenic one of the two. If you like it a lot, traversing it both before the Bald Peaks loop and after would not be a bad idea either, which was the route I used to show for this ride before the rest of Longwall Canyon Trail through Calera County Park was opened to bike access in 2014, allowing the easier return to the parking lot you see on this page today. As you cross Baldy Ryan Creek over a bridge (along with an option to ford the water, if you feel like it) and reach the junction of Mayfair Ranch and Longwall Canyon trails, you're effectively faced with the primary routing choice that the park's trails give you: You can either do a full loop of the trails north of the creek, or climb to and descend from Bald Peaks over Longwall Canyon Trail and make it into an out-and-back ride. (Doing an out-and-back solely on Catamount Trail would be masochistic and pointless, in my opinion.) What should drive your decision is whether you'll be willing to brave the crazy climb up Catamount Trail. This particular route follows the loop option. If, like me, you prefer to use wider and steeper trails for climbs while you save narrower and more playful trails for descents, then the only meaningful direction in which to do the loop portion of this ride for you will be counter-clockwise. The climb from the creek bed all the way to the highest elevation of the ride (a net change of a little over 1000 feet) lasts a bit over two miles. However, the crucial part of the climb starts around the four-mile mark from the very beginning of the ride, where a 0.15-mile stretch of the trail maintains an average grade of about 24%. After a negligible break, another 0.2-mile section averages nearly 19%. The rest of the climb continues to be a seriously challenging one, but it's never again as prone to make you question your route choice as those two worst segments. Catamount Trail is in the form of a wide and smooth fire road, which is a bit surprising since the website states that it, too, was built in 2007. I suppose even some newly built trails can be in the form of fire roads these days, when they are meant for access by park ranger vehicles. Bald Peaks Trail is another wide and smooth fire road. However, this is one of the most enjoyable portions of the ride due to the scenic nature of this bare trail. Before too long, you take Longwall Canyon Trail from its upper end and this marks the start of the twistier part of your descent—nothing but 1.5 miles of gentle descent through pretty oak woodlands all the way back to the creek bed. From there, Longwall Canyon Trail transforms into a fire road and continues gently downhill back toward the trailhead. Initially, the trail twists as it follows the folds of the hills. After you've reached the same junction with Catamount Trail you had arrived at earlier, Longwall Canyon Trail becomes a lot flatter and straighter as it passes through Calero County Park (whose boundary is clearly marked by a gate). Longwall Canyon Trail included a couple easy crossing of minor seasonal streams in its middle region, but its main water feature arrives just before it drops you back onto the park's driveway (Casa Loma Road) where you need to negotiate a wet crossing of Baldy Ryan Creek. This is not a very difficulty creek crossing. I'm not too familiar with how its water volume changes by the season, but it had just enough water to make it a decent practice crossing for less experienced riders during my most recent ride in May.